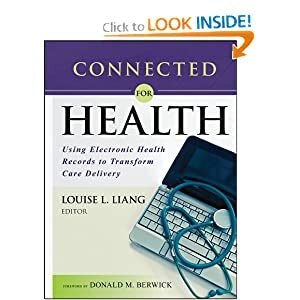 In a new book edited by Louise Liang, the story of the comprehensive implementation of the EHR at Kaiser Permanent. The story begins in 2002 when George Halvorson, the new CEO, saw the need to implement the EHR not as a cost savings initiative but as a market differentiator. He laid down the challenge to accomplish this national implementation in 3 years. What this represented was not just a software implementation but an organizational change from 9 relatively independent regions to a single practice model centered around this technology. They developed the Blue Sky Vision with consumer centric focus including these themes: home as the hub, integration and leveraging, secure and seamless transition, and customization (perhaps better stated as patient-provider partnership). The book not only provides a history of this organizational and technology change but also lays out a project management roadmap that can be emulated for smaller hospital systems and hospitals. Regardless of size, EHR implementations must take into consideration timeline, stakeholders and technical challenges. For Kaiser, the timeline affected the implementation in several ways, most notably in delaying customization of provider templates and smart forms until after the go live. Involving stakeholders, two chapters address the building of clinical content by physicians and nurses. They state, “clinicians won’t necessarily be faster, but they should be better” referring to improvements in patient safety and other clinical decision support aspects of the EHR. The role of the patient as a significant stakeholder is addressed in a chapter about My Health Manager, the MyChart product from Epic Systems which was implemented to included eVisits and patient-provider messaging. Part of the vision from the initiation of project is value realization beyond utilizing the EHR in routine clinical practice.This involves aligning KP HealthConnect with KP values: high quality care, personal care, convenient and affordable. The three phases of value realization are: value creation, value requiring harvesting and transformation of care. This steps included everything from reducing duplication of services, to re-engineered workflows to developing metrics around best practices and clinical guidelines. Population care has become a reality including practice innovation. While most of the care management emphasizes primary care (including a chapter on Redesigning Primary Care), there is some material on specialty practices, such as, oncology. Adding value for KP HealthConnect also means improving patient safety and enhancing research. In the safety realm, one of the most important concepts behind the EHR which should be true of every EHR is “Making the Right Thing Easy to Do.” This is where may EHR implementations fail, actually accomplishing quite the opposite and leading to open rebellion by clinicians. If the right thing is easy to do and especially easier than paper, then this single fact makes the cost worth the investment. In research, the efforts are still at early stages but include retrospective and prospective research, comparative effectiveness research and personalize medicine/genomics. As an adjunct to research, a chapter is devoted to the Archimedes Model as a future direction for KP. Utilizing EHR data, the model takes population studies to a new level by simulating clinical trials and developing mathematical predictive models. Has Kaiser realized its Blue Sky Vision? The implementation was certainly accomplished on time but admittedly over budget (3.2 billion vs. 4 billion). At one point, the authors admit to the technical challenges which resulted in stopping the accelerated weekly implementations. Stress on the IT core systems forced a six month hold. Overall the book presents an optimistic view of EHR implementation, successful because of systematic, team approach including all regions and all professions. Many of the themes in the book are reminiscent of the optimism of Health Care Reform and EHRs which some times seem a distant dream with very gradual adoption. Who should read this book? First, any hospital or healthcare system planning or in the midst of an EHR implementation. Second, hospital CIOs but perhaps more importantly, project managers. Project management professionals are the boots on the ground of EHR implementation and need to learn how to involve stakeholders and move past obstacles toward successful, on schedule implementation. Also, those interested in exploiting or harvesting the value of the value of the EHR in quality improvement, patient safety and research. Finally, clinicians who are involved in EHR implementations or governance will better appreciate the need for vision and the comprehensive impact of EHR on practice and potential practice innovation.